Why use your hands when you can dunk with a set of Oreo-branded tongs? If you’ve dunked enough Oreos in your life, this has inevitably happened to you: The milk in the cup softens the cookie to the point where its structural integrity is ruined, thus sending the bulk of your Oreo into the liquid, leaving you clinging to the tiniest remnant of your previously mighty dessert. To heck with that nonsense, says Frankford Candy. For the holidays, the sweets company has released the Oreo Ultimate Dunking Set—a gift packed full of everything you need to reach the level of professional Oreo dunker in no time. 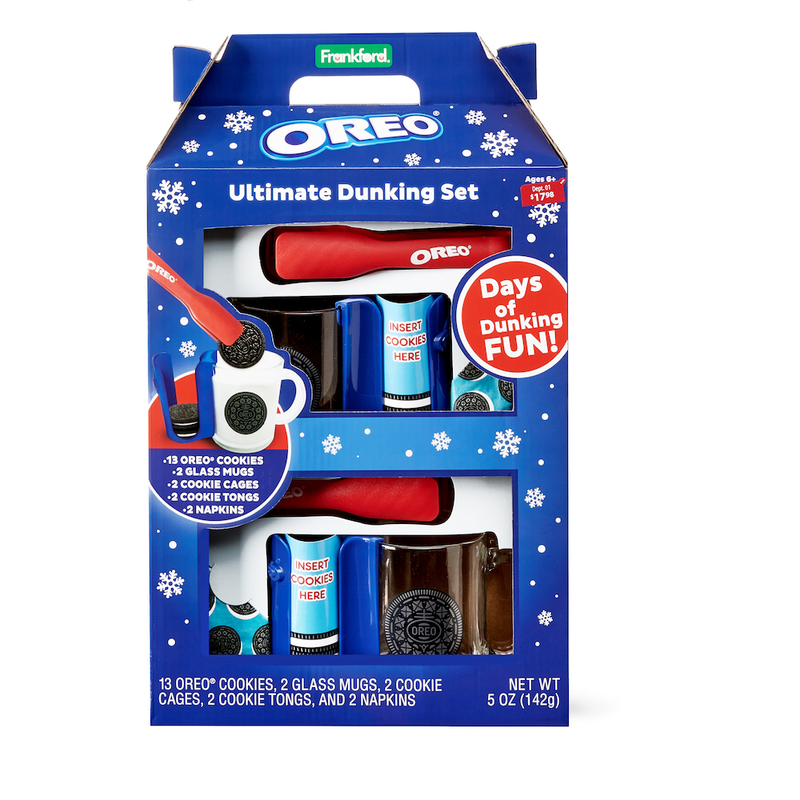 For something most of us do without predetermined equipment, this set contains a surprising number of items: First, it has its own mug—which importantly, outside of an image of an Oreo on the side, is clear, allowing the dunker to observe any errant Oreo bits that have sunk to the bottom. It also comes with a “cookie cage”: an odd little device meant for holding undunked Oreos while awaiting their trip into the milk. The cage even conveniently hooks onto the side of the mug for easy travel. Then, there’s the key to any Oreo dunking kit, the tongs—which are beautifully Oreo branded. If that’s not enough the single-size set also comes with three Oreo cookie pouches as well as a napkin in case you make any mess. Though this Ultimate Dunking Kit originally caught the internet’s eye thanks to a post by Instagram user Snack Betch, a similar, double-sized set—featuring two mugs, two cookies cages, two sets of tongs, two napkins and 13 Oreo cookies!—can also be found on Walmart’s website. Sadly, the item is out of stock there, but it does establish that the price would have $17.98. Not bad for a kit providing all the dunking essentials outside of milk. Meanwhile, Snack Betch says the dunking set they found was available at Rite Aid. So who knows: Maybe these Ultimate Dunking Sets aren’t that difficult to find?